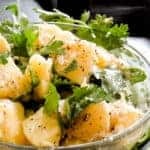 Healthy Garlic-Olive oil Potato Salad (vegetarian, vegan). Healthy Garlic Olive oil Potato salad, flavors for summer days and the outdoors. Vegetarian, vegan. I’m taking inspiration from italian flavors using Olive oil, Garlic combination to introduce my terrible four to Summer salads. You can even toss a few Pickled Garlic to add a more subltle tang to the salad. Recipes to try- Turmeric infused baked potatoes. Everyone has their own favorite Potato salad that they love and stick to but if you are thinking of trying something new then I hope you try making this version of the salad. You’ll be surprised how simple combinations can work together. Your everyday, ordinary Potatoes gets jazzed up with just three ingredients that are staples in any home kitchen aiming to feed their family healthy food. 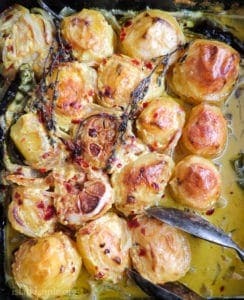 What main dishes can I serve with this Garlic-Olive oil Potato Salad? Basically any Meat, poultry and fish dishes, grilled or baked will compliment the simple salad. if you prefer to keep the menu vegetarian then grill a few vegetables to accompany this side-dish. Avoid rice as you already have the starch from the Potatoes. 3 thing to keep in mind when Boiling Potatoes. 1/ If you have a variety of potatoes to choose from, choose potatoes that can handle the boiling temperature and still keep its shape. 2/ Although it will take 15-25 minutes for the whole Potato to become tender make sure to check if it is done after 10 minutes as smaller ones can cook faster than larger ones. 3/ Do not add the Potatoes to boiling water but place them in cold water and let them cook as the temperature rises. 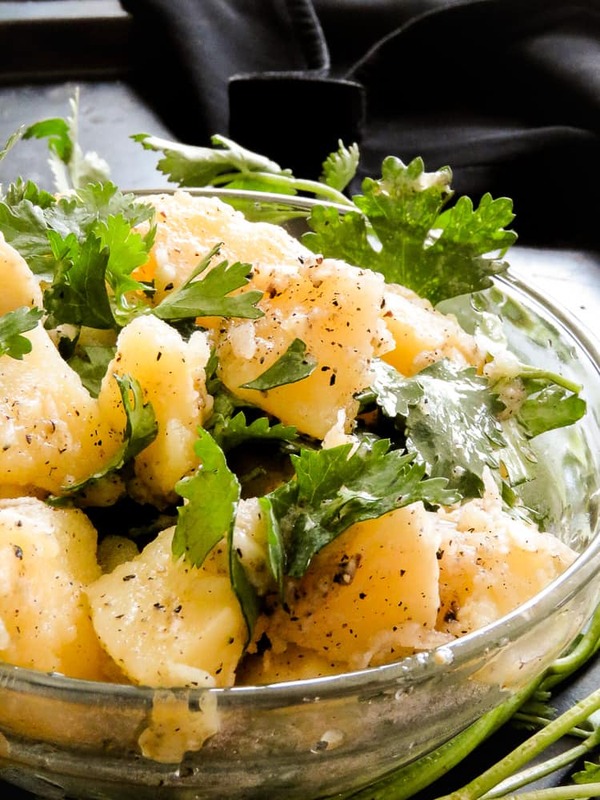 RECIPE- Healthy Garlic-Olive oil Potato Salad. Please make sure to read the recipe instructions to avoid mistakes. Wash the Potatoes, place them in a pan of cold water and gradually let it boil over high heat. avoid covering the pan as the Potatoes boil. 5 minutes into boiling the Potatoes, add Salt. When the water starts boiling, reduce heat and leave it to simmer on low fire until the Potatoes are cooked, 15-20 minutes. Once the Potatoes are cooked through, immediately run cold water through them, drain and leave it to cool. Peel the skin of the cooked Potatoes and cut them to required size and set aside. In a medium sized bowl, add Olive Oil, Pepper, minced Garlic, chopped cilantro, combine these ingredients, season with Salt if needed. Add the Potatoes to this bowl of ingredients and gently toss them through, making sure all the ingredients are incorporated. Serve immediately with your favorite meat dish. Healthy Garlic-Olive oil Potato Salad ( vegetarian, vegan). 1/ If you have a variety of potatoes to choose from, choose potatoes that can handle the boiling temperature but still keep its shape. 3/ Do not add the Potatoes to boiling water but place them in cold water and let them cook while the temperature rises. Peel the skin of the cooked Potatoes and cut them to required size and set them aside. 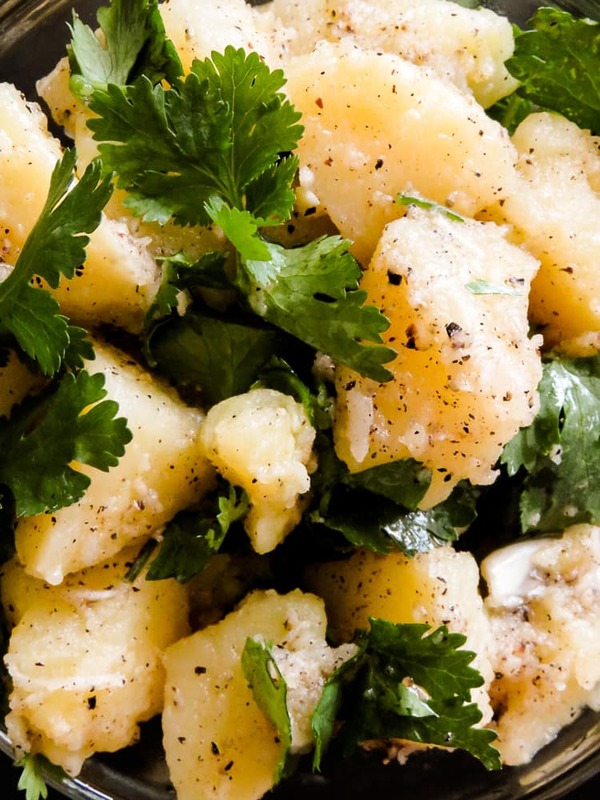 For more recipes like this Healthy Garlic-Olive oil Potato Salad. Please subscribe to the blog by adding your email address in the subscribe box and you will get all the recipes I publish straight into your email. You can also find me on Facebook, Twitter, Instagram and Pinterest.